We’ve all heard the expression “Diamonds are a girl’s best friend”. Until recently, there has been no best friend for people buying diamonds. That is until now. Be it a diamond wedding or engagement ring, an anniversary diamond necklace or the bracelet your daughter just has to have, in the past there hasn’t been much of a break on the price the consumer pays. For as long as consumers have been wearing diamonds there has existed an extensive diamond industry supporting the process from extracting the stone from the ground to turning it into a piece of jewellery. One reason why diamonds are expensive is the rarity of the precious stone. Prices vary on size, cut, clarity and certification. Another reason that diamond prices are so high is that each stage of the production process requires getting someone else involved, introducing more costs. To put it plainly, the cost to reach a diamond’s final destination is always absorbed by the consumer. In the past, the problem for the diamond industry was that buying diamond jewellery involved many stops along the way. 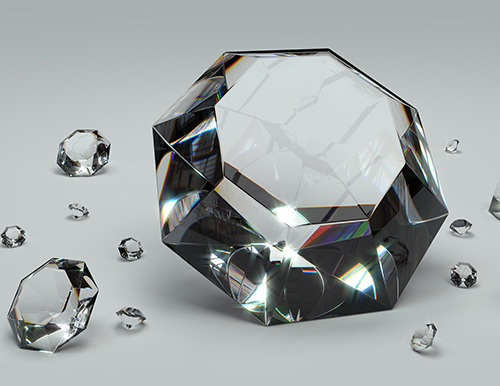 The logistical diamond supply chain includes the miner, cutter, polisher, insurer and every middleman until it reaches the store. Each stop adds more costs and increases the end price charged to the consumer. Also, the traditional way diamonds are traded and sold involves a lot of trust. Diamond buyers and sellers have to first develop a strong personal relationship. Even this trust is not fool proof and there are plenty of opportunities for theft, fraud and simple error when dealing in a paper based environment. Imagine if it were possible to increase the efficiency, security and lower the risk and price that the final consumer pays to purchase a diamond. With the traditional operation of the industry, this was nearly impossible. The introduction of blockchain technology makes it now possible to reduce a lot of the inefficiencies present in the conventional system. A diamond blockchain platform would allow for buyers and sellers of diamonds to communicate directly and more transparently, by cutting out a lot of the intermediary costs and potentially reducing the final price consumers pay for diamonds. Brokers and middlemen would become redundant and the buyer would be in direct contact with the seller. Multiple profit margins would not be added to the price fixed by the seller, the buyer would end up getting more value at every price point. GLITZKOIN intends to build a blockchain technology platform and reshape how diamonds are bought and sold. The project relies on the use of blockchain technology to decentralize how diamonds are traded. By using this technology, retail consumers of diamonds will be able to see any certified diamond that is available on the blockchain. They will no longer be limited to buying what is at the store or website but can buy any certified listed diamonds from anywhere in the world.